Speaking of Research try to keep on top of the latest statistics coming from governments around the world. Ireland’s 2016 statistics were recently released by the Health Products Regulatory Authority of Ireland (HPRA). 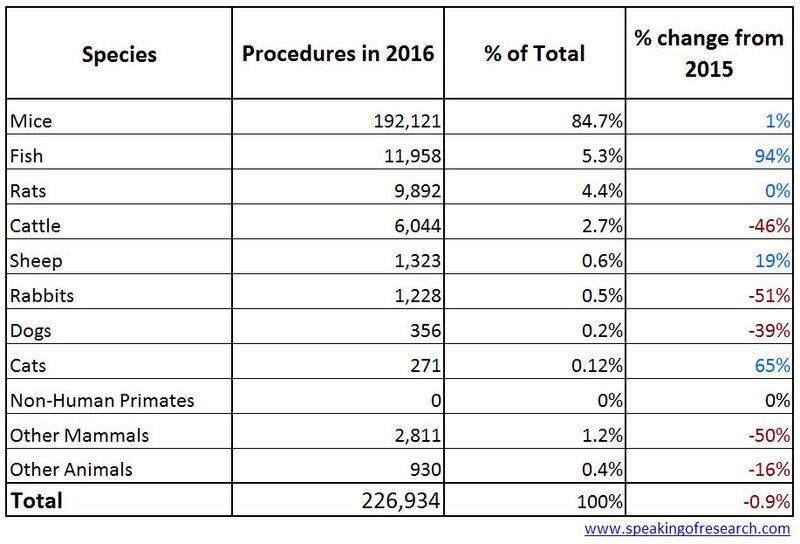 Ireland carried out 226,934 procedures on animals in 2016, 1% less than in 2015. A procedure is defined as “any use of an animal for scientific or educational purposes, which may cause the animal a level of pain, suffering, distress or lasting harm, equivalent to, or higher than, that caused by the introduction of a needle in accordance with good veterinary practice.” This definition includes the development and care of any genetically modified animal in which pain or distress may result. Mice continue to be the most commonly used species at almost 85%. 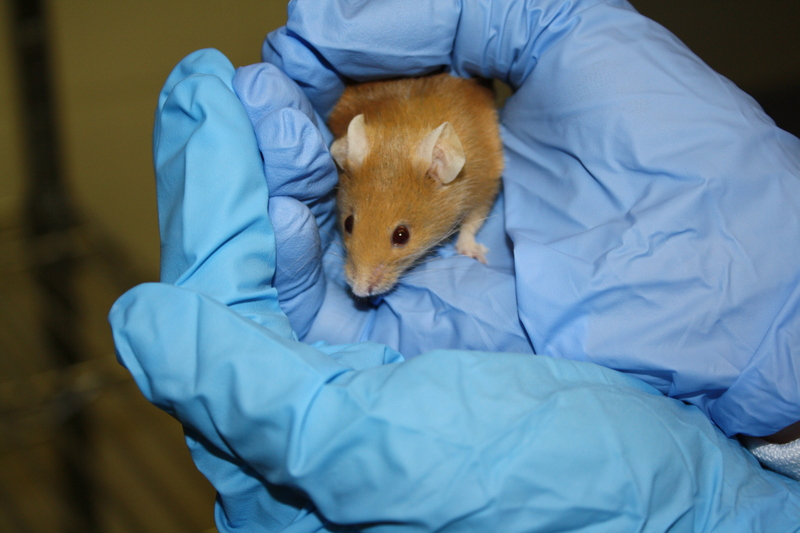 Together, mice, rats, and fish account for 94% of all animal procedures. No non-human primates were used in Ireland in 2016. Dogs and cats accounted for less than 0.3% of all animals used. Dog numbers fell by almost 40%, while there was a large rise (65%) in the number of procedures on cats. Both species were used exclusively for veterinary research. 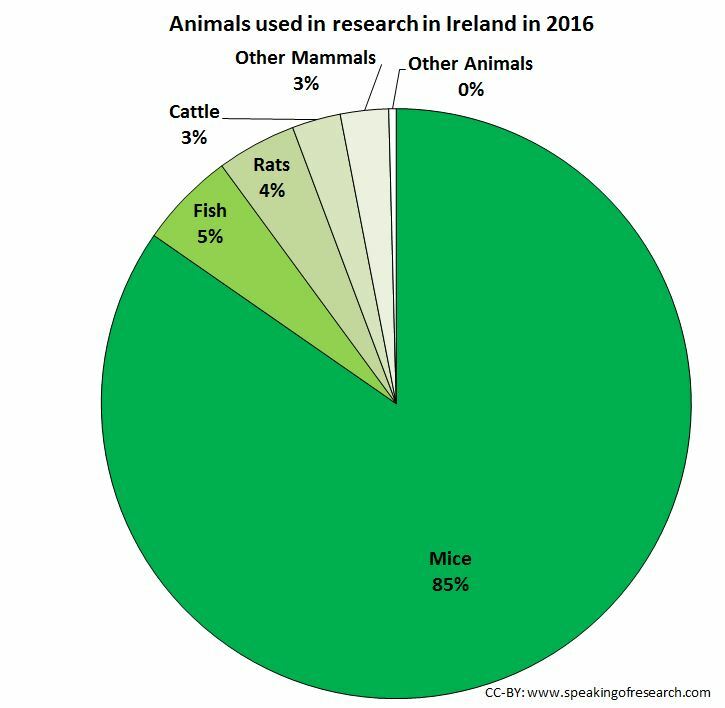 Once again, 99% of animals used in Ireland were bred within the European Union (EU). There was a pig fall in cattle compared with 2015 (down 46%). According to the HPRA, “cattle are used only for agricultural research studies (for the benefit of the species or the agricultural industry)”. According to the HPRA report, 75% of the total number of animals used was for regulatory purposes, this is “use of animals in procedures with a view to satisfying legal requirements for producing, placing and maintaining products/substances on the market, including safety and risk assessment for food and feed“. The next most common use was for basic research (13%) followed by translational and applied research (12%). The report showed that 44% of procedures were classified as mild, 26% moderate, 29% severe, and 1% non-recovery. 99% of severe procedures were on mice. Page 17-18 of the report has definitions for mild, moderate, severe and non-recovery. 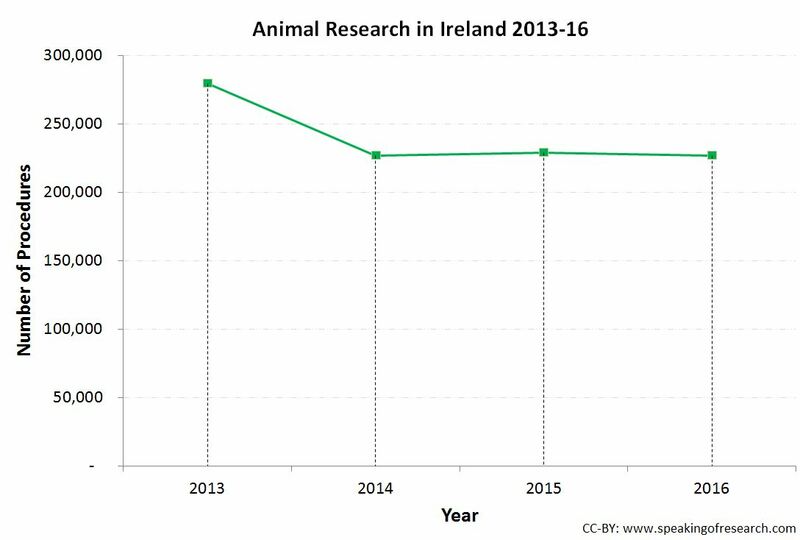 Trend over time in animals used in research in Ireland. Click to Enlarge. Since 2014, the number of animal procedures in Ireland has been fairly constant at around 230,000. Posted on November 1, 2017 by EditorPosted in News, StatisticsTagged animal statistics, EU, ireland, Statistics. Next Next post: Research Roundup: Fishy feelings, young blood and Alzheimer’s disease and more!